Some of the previous entries in this series have been mashups which actually looked more like a team’s traditional colourway than the default kit at the time – Inter Milan in 2016-17 for example or Germany at the 2016 European Championship. One would think, therefore, that a Mexico kit with red socks would be in a similar vein, but what they wore against Croatia at the 2014 World Cup was very much out of the ordinary. In their opening Group A game against Cameroon, they had worn their default home kit, which featured socks with a lot more white on them than usual. Then, against hosts Brazil they were in their new away kit – while they generally go with white (as they did in this year’s competition), this time it was orangey-red and black. For their final group game, against Croatia, they had to mix things up. 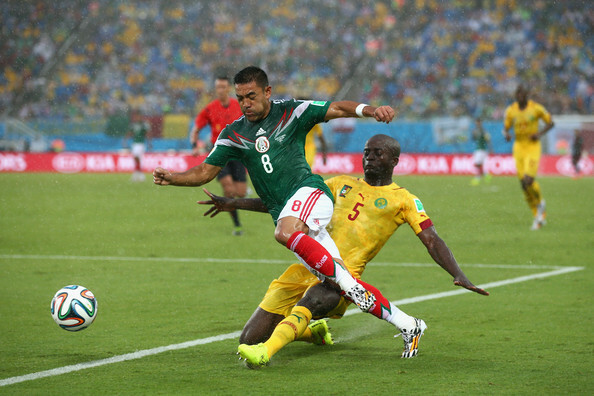 There was a direct shorts-clash, which was solved by Mexico wearing their black away set. However, having worn their blue socks in the previous two games, here Croatia wore white, which were deemed to clash with Mexico’s primary set and so the North American side switched to the second set here too. It made for an odd look, to say the least. Nevertheless, Mexico didn’t let their unusual kit combination distract them and a 3-1 win earned them second place in the group. Paired with the Netherlands in the last 16, they wore a third different sock-style, almost all-white, to avoid a clash with the Dutch orange. Unfortunately for them, they lost 2-1 as Klaas-Jan Huntelaar scored an injury-time winner. All good, but Mexico is part of North America, not Central America.